An injured hawk found at the Picture Butte Golf Club last week is doing well. Early on Monday, Aug. 13, golfers found a juvenile hawk at the Heritage 6 hole at the Picture Butte Golf Course. Upon discovery, the golf club’s staff contacted Alberta Fish and Game and the Birds of Prey Centre in Coaldale, who picked him up that day. “One of our players noticed him on his way through one of our holes,” said Dean Sklarenko, executive golf professional. “There are hawks that are here annually, but it’s on occasion that we’ll get one that’s sick or hurt or wounded, but it’s not anything we’ll expect. The hawk in question is a fledgling male Swainson’s Hawk that is approximately 80-90 days old, and at the time of discovery, it had been starving to death. Birds of Prey manager Colin Weir said that it at this time of year, these hawks are just leaving the nest, and instances of finding starving ones increase. If the people at the golf club call in the hawk when they did, the hawk would have died. 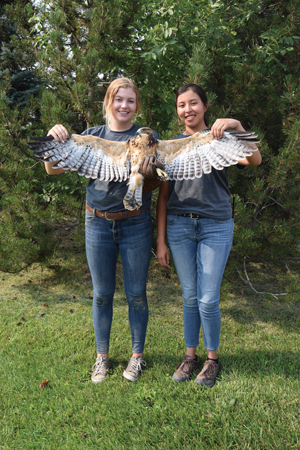 “Swainson’s Hawks, like all over Southern Alberta, are just jumping out of nests at the moment, and some of them do well, some of them need a bit of a helping hand,” said Weir. Swainson’s Hawks tend to nest later then most birds, so you will start to see fledgling hawks start to jump out of their nests around early August. With the exception of the hawk needing to regain weight, he is otherwise okay health-wise, but is “pretty, pretty hungry”. Weir says that once he has gotten back up to a normal weight, they will release him back to the wild. Depending on how long it’ll take, the hawk will likely be released either by the end of September, or next spring. Swainson’s Hawks are the most common type of hawk you will find in the Coaldale and Picture Butte areas. As their favourite food are gophers and mice, they provide a very valuable pest service for farmers in the area. They don’t stick around for the infamous Alberta winters though, and they start their migratory 10,000 km trip to Argentina in mid to late September. For more information or to report an injured bird, contact the Birds of Prey Centre at (403) 345-4262.